Airboss is gone 😦 We had his farewell yesterday. He went to the carrier for the rest of the deployment and we sure are going to miss him. 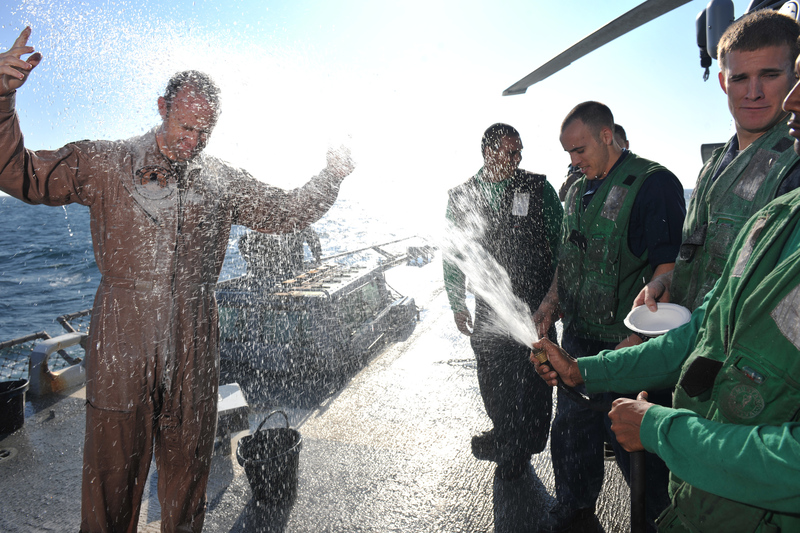 On his last flight aboard the ship, he logged his 2,000th mile and in celebration we hosed him down and antiqued (poured flour all over) him! 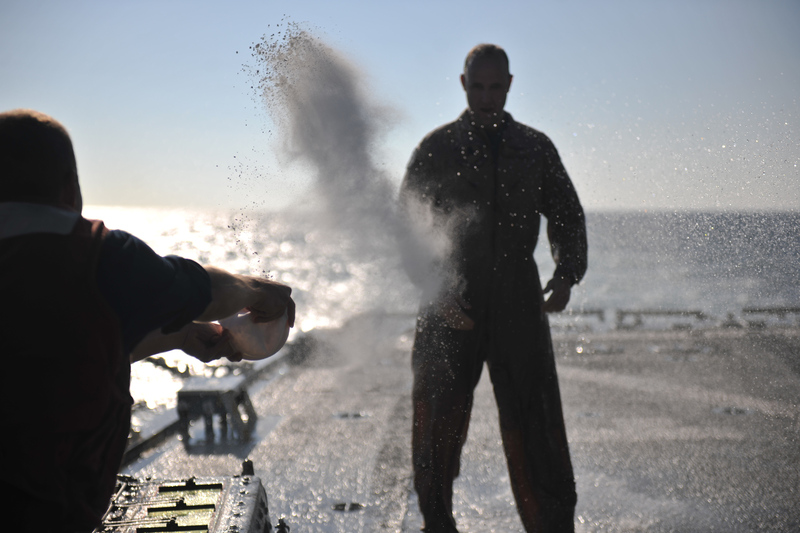 The plan itself backfired a little bit because he was sitting on the starboard (right) side of the helo and when he got out of the helo he backed up and I couldn’t get around to throw the flour in his face. 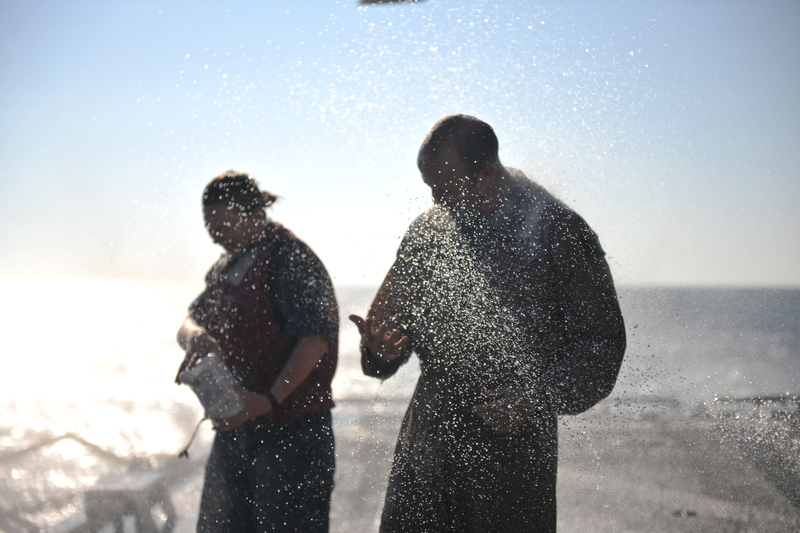 Instead I had to climb under the tail of the helo because of the restrictions on the flight deck with the nets down and when I threw the flour at him, the wind blew half of it back on me. Now its My Turn. This Flower is just about to blow back on the both of us. haha. 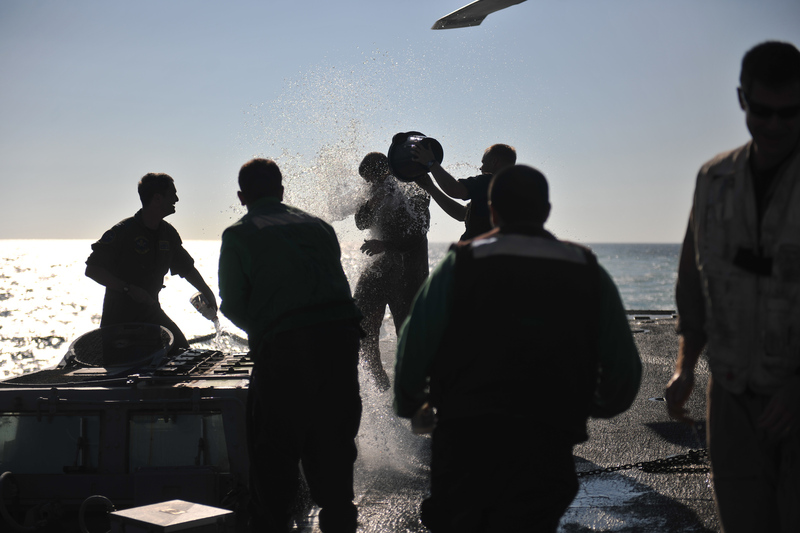 There’s the rest of the air crew getting him good with flower and water. I was so happy they let me join in on the festivities since technically I’m not actually part of the air crew. This is the aftermath. As you can see it didn’t go very well in my favor but I would say at least 1/4 of the flour did land on Airboss. And that’s the finished product with Airboss. I love this pictures. haha. The British officer that was onboard with us for a few days saw me afterwards and he was laughing so hard. He said, “What happened.” And when I told him he said, “Bloody hell, that’s a typical school girl mistake.” hahaha. On the night before they pull back into England they have a “Channel Party” in which they transit the English Channel and proceed to get completely sloshed. He said on his last ship when they were going up the channel and from the stories he was telling it seems like a pretty good time. 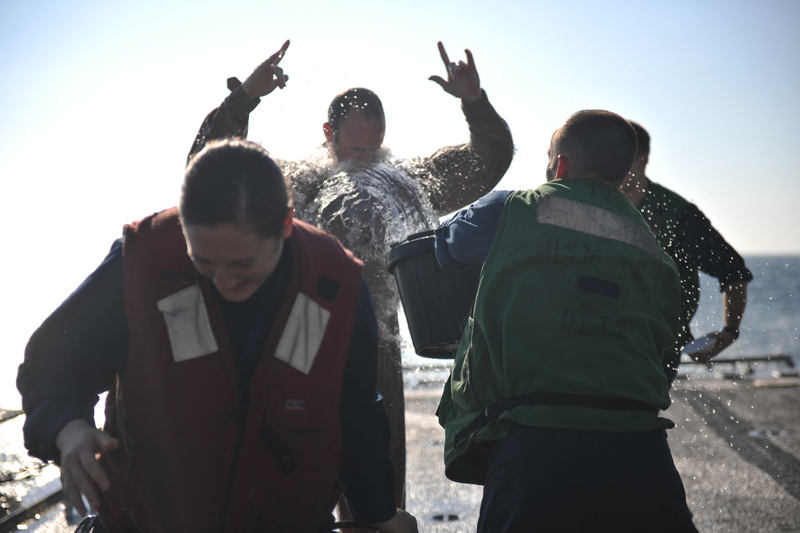 I don’t want to get him in trouble otherwise I would tell you, but just know that drunken fun at the end of a deployment = crazy times! I was very educated on British formalities. This launched an entire conversation about the dutch because apparently on dutch warships everything is co-ed, even the bathrooms! I’ll save that for another day. I’ve got to go. I get promoted to LTJG (Liutenant Junior Grade) tomomorrow on our transit through the Suez Canal, so that should be interesting. The captain says he has something big in store. Standby for that. I’m moving from gold bars to silver. Woot Woot! 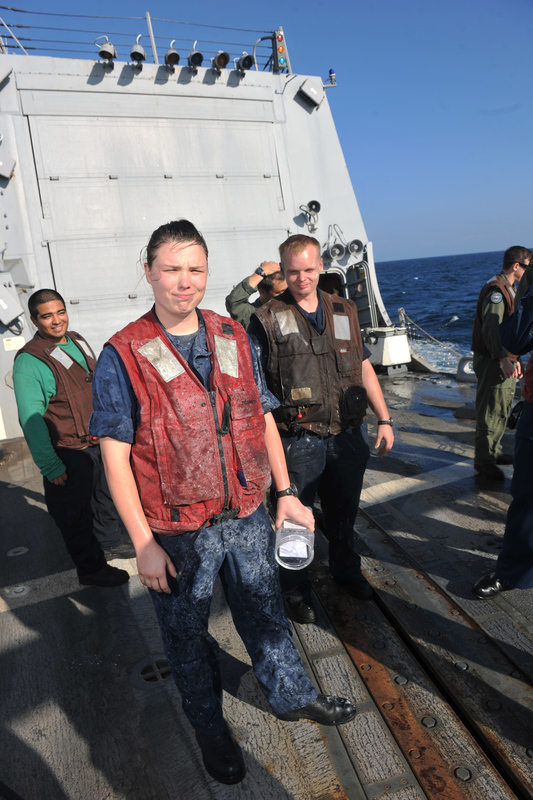 This entry was posted in My First Deployment, NAVY, Travel and tagged 000 miles flown, Airboss, Antiquing, celebrating 2, Farwell, flour, navy, open ocean, Saying goodbye to a friend, travel, underway, water by Cassey. Bookmark the permalink.